I noticed that for the past few months, I’ve focused so much on pampering my skin every day and night with skin care and anti-aging products that I’ve neglected something else that enhances my eyes, and they are my eye lashes. I put make up almost every time I head out, and mascara is one the MUST for me in order to bring out my eyes and to cover up my dull and sleepy looking eyes. Hey don’t we all sleep late most of the time? 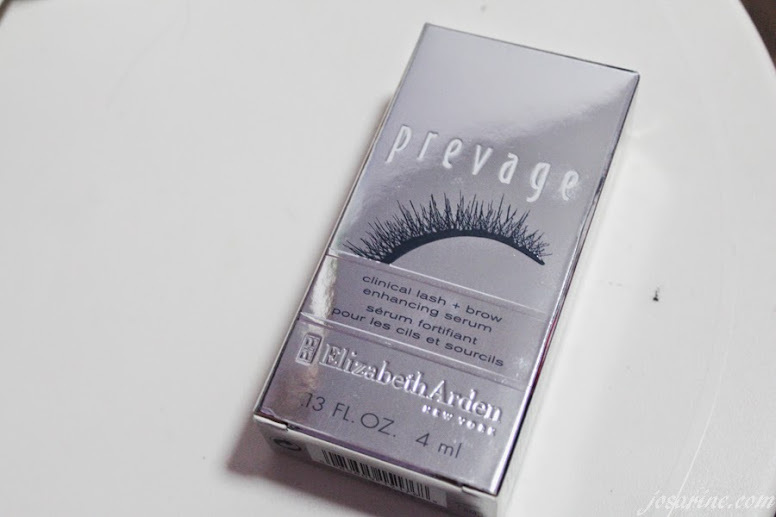 Lately I got to know about Elizabeth Arden’s PREVAGE® Clinical Lash + Brow Enhancing Serum through Nuffnang, so yes many thanks to Nuffnang for sponsoring this for me to enhance my eye lashes. I really love the design of this product as it looks elegant and grand unlike some of the other eye serums which its body tends to look and feel very plastic. Honestly, I thought the brush would be like a mascara type of brush. When I opened the product and saw that it was more like an eye liner brush made me wonder for a second how to apply. I always thought that the serum should be applied on the lashes in order for it to grow longer, but actually if you think about it, it’s better to apply at the roots. This Elizabeth Arden PREVAGE® Clinical Lash + Brow Enhancing Serum would help make lashes and brows appear longer, fuller and of course healthier in just two weeks if used daily. So, how to use? 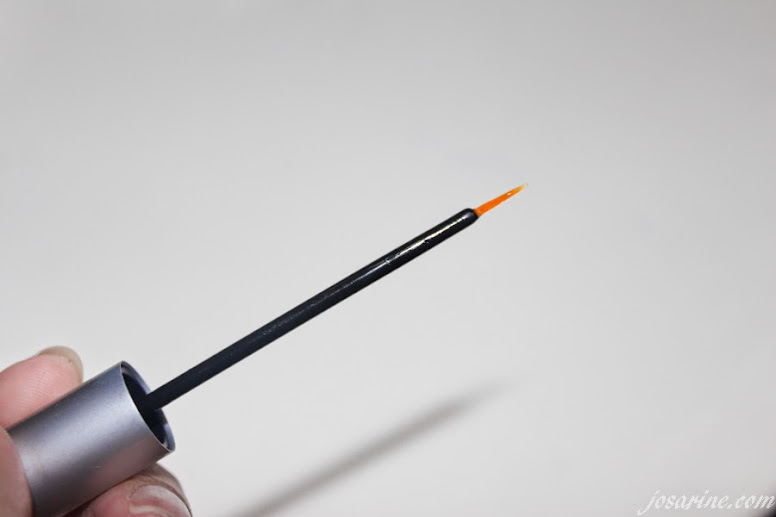 Just apply the serum right above your lash line like how you apply your liquid or pen eye liner. Apply from inner to outward on both lower and upper lash lines. 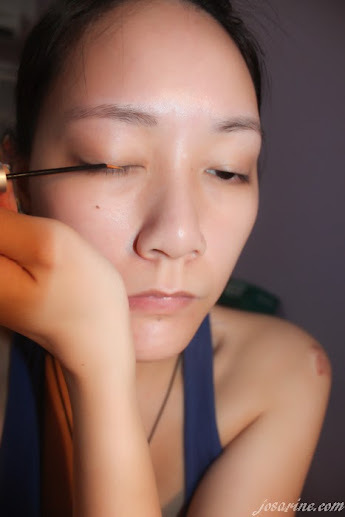 For me I just applied upper lash line. So I was given a lash measuring card to measure my before and after lashes. 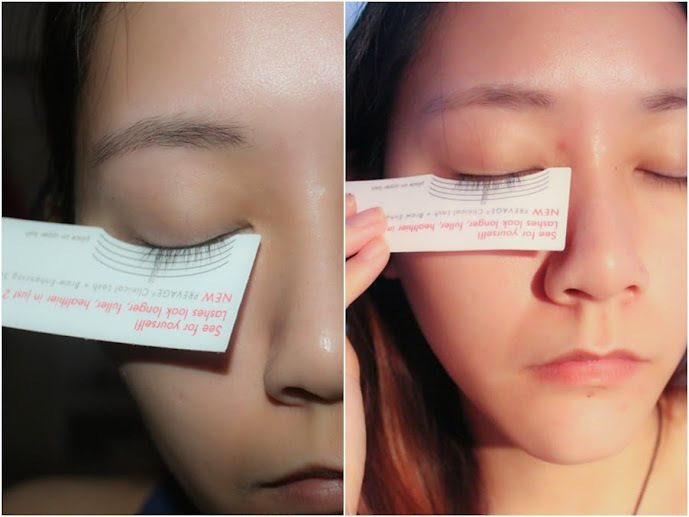 Just because I’m Asian I don’t have very long lashes, so my first measurement for BEFORE is 08 if I place the card very closely to my upper lash. As for my after, it also shows 08, but if you look at my AFTER picture properly, I did not place the card very closely to my upper lash as compared to the BEFORE picture. 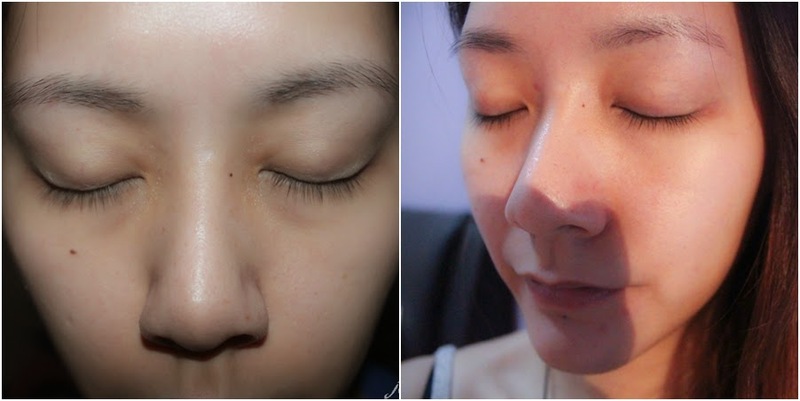 This shows that there’s definitely improvement in lengthening after using this product for about 2 weeks. As for volume, I noticed that before I started using the lash serum I noticed some sparse spots on both of my eye lashes. The left picture is taken with flash so you can see some sparse areas. The picture on the right is the after picture, taken without flash. I noticed even after 3 days of using the lash serum, I could see baby lashes growing! Yay! I was very amazed at how quick I would see some results even if it’s a minimal result. So did the serum work? Yes it did! By far this serum has showed me results pretty instantly, and like I said even if it’s minimal results, but it was unexpected from me. When I first got the product, I thought at least wait for a week or so to see some results, but seeing baby lashes growing in just 3 days? Plus, lately when I removed my mascara I noticed there’s hardly any lash fall as compared to before. So yes I’m loving this product. Sometimes I forgot to apply it before sleep, so I apply during the day after I’ve cleansed my face when I’m not going out. What makes this eye lash serum different from others? When Tocopheryl Acetate (Vitamin E), Retinyl Palmitate (Pro Vitamin A) and Ascorbyl Palmitate (Vitamin C) are combined together, they help with protection of hair fibers from external aggressors and environment assaults. Panthenol which contains Pro Vitamin B5 on the other hand helps with conditioning the lashes and helps with the flexibility and durability of the lashes. - Would not darken eye lids or change iris pigmentation as it I prostaglandin free. 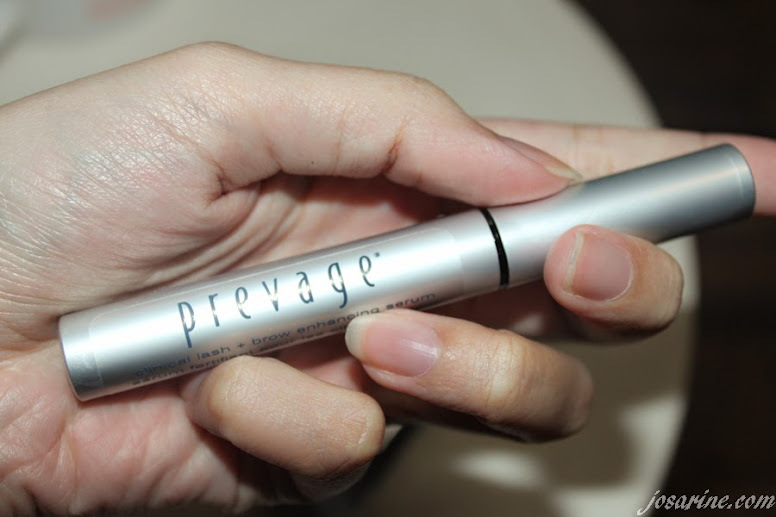 - Proven to work on both upper and lower lashes, as well as improve the look of thinning eyebrows. - Contains vitamins A, C, and E.
This product can be found at Elizabeth Arden Counters nationwide at RM380 for 4ml. Do watch the video to understand better and see more. For more info, please visit their website, www.elizabetharden.com.